News reports about climate change often focus on how the average global temperature is rising, but perhaps more attention should be paid to some alarming trends in extreme temperatures — the conditions that are more likely to kill people and push species toward extinction. From 1986 to 2015, hottest-day-of-the-year readings climbed by 0.25 degrees Celsius per decade, the UCI study found. 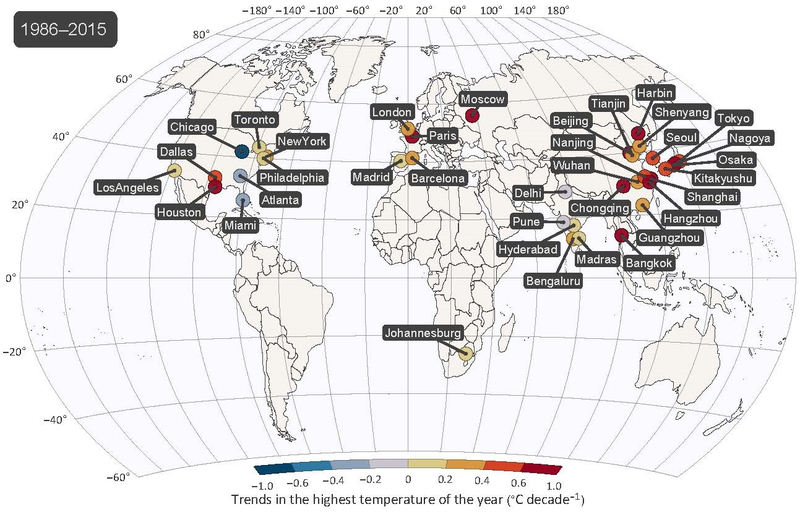 Some megacities saw a rise of 0.60 degrees Celsius per decade. A new study published last week revealed that temperatures across the Earth’s surface went up an average of 0.19 degrees C (.34° F) each decade over the past 30 years, whereas the highest temperature recorded each year has gone up even more — an average of 0.25 degrees C (0.45° F) per decade. The study, led by Simon Papalexiou of the University of California at Irvine, calls out even greater changes in the extreme temperatures in specific locations. Average change per decade of 0.33 degrees C (0.59° F) were measured in some parts of Europe, Asia, Australia and Africa. Download PowerPoint map (PPT 1.4 mb) from the report in the journal Earth’s Future. Meanwhile, hottest temperatures recorded throughout the world grew even faster in some of the largest cities, according to the study. Of the cities for which reliable data are available, the increased temperature in the “megacities” rose an average of 0.33 degrees C (.59° F) per decade, and numerous cities exceeded 0.6 degrees C (1.08° F). Over a 50-year time period, Paris had the fastest change, with the hottest temperature of the year growing by 0.96 degrees C (1.73° F) per decade. Over the past 30 years, Houston’s hottest temperatures grew even faster, rising 0.99 degrees C (1.8° F) per decade. The urban heat island effect, which is caused by solar heat absorption in concrete, steel and glass structures, is “likely to have contributed to the observed alarming changes,” the report says, adding that a better understanding of the causes could help reduce the risks for people living in cities. Amir AghaKouchak, a co-author of the study, said government officials will need to pay more attention in the megacities, where the risks are greatest. “In France after that massive heatwave (in 2003), now all nursing homes or places where there are a lot of vulnerable people have to have at least a common room with air conditioning,” said AghaKouchak, quoted in a Reuters story by reporter Laurie Goering. Architectural styles and green areas with trees and plants may help reduce the everyday risks to those who don’t have the resources to protect themselves. The greatest problems surrounding climate change won’t be seen in the averages but in the new extremes — the temperatures, sea levels and rainy downpours never before experienced at a given location. The website WX shift (pronounced “weather shift”) was designed to tell people about changing climate trends, including “The 10 hottest years.” For example, of the 10 hottest years on record, only two occurred before 1998 (1934 and 1990). The five hottest years on record have all occurred in the past 11 years. WX shift also contains predictions for the number of days a given location will reach a high temperature. See “Future days above 95° F. This interactive graphic is said to be based on historical records and climate change models, as explained at the bottom of the page. Another graphic on Climate Central’s website helps explain how a small change in average temperature can lead to an increasing number of record-breaking temperatures and more extreme conditions. I know ‘climate change” is big in the news but most people really don’t believe it is happening. In point of fact Dunagins’ article is full of misstatements and “hooie”. The Michael Mann hockey stick is debunked. In fact we are in a cooling trend now for some years. The Polar ice cap is expanding. Before the adjustments in observed data the hottest decade on record was the thirties. The enormous treasure being spent on new and more evil ways to tax us and increase the cost per kilawatt are unsustainable. Lack of proper power sources that are affordable has kept the third world in the third world. Wake Up! We exhale co2, trees inhale co2, trees exhale oxygen, we inhale oxygen. Co2 levels are a good thing. Better crop yields. In the 70’s we were headed for an ice age in ten years. In 2000 Gore said we’d be water skiing in the florida swamps. This has been proven false, just like all the other gloom and doom weather predictions that failed to materialize. Observed weather is consistant with the weather we have been having for thousands of years. Another thing; scientists who make money (grants, etc..) on the theology of climate change are cheating themselves out of doing real research that might change the world in a good way rather than cheating the poor. I can’t imagine how some people sincerely believe that the climate is cooling, given that data examined by scientists throughout the world point toward a warming Earth. Some of the serious questions now under investigation: How fast will average temperatures rise? What will be the local effects of changing weather patterns? How will various plants and animals be affected? I always try to show where I get my information when writing about issues. That’s the least I expect from someone who comes on my blog to tell me that I am not reporting things accurately. So, please, do share your sources of information. I try to keep an open mind, but your comments sound like a mishmash of anti-climate-change rhetoric with little basis in fact. Perhaps you would benefit by checking out some of the information sources I mentioned in Water Ways two weeks ago. Our society really needs people to become more educated about climate change and science in general.